Beggars All: Reformation And Apologetics: Luther: The Infallible Church Declared The Contents of Scripture? Martin Luther makes a pertinent observation in the sixteenth chapter of his Commentary on St. John "We are obliged to yield many things to the papists [Catholics]—that they possess the Word of God which we received from them, otherwise we should have known nothing at all about it." [Jason Evert, How to Defend the Deuterocanonicals (This Rock Volume 11, Number 9, September 2000)]. These are but two examples from This Rock Magazine, an actual Roman Catholic publication. If one were to do a quick Internet search for this quote, the quote is used often and vigorously. See for example, this search. The online defenders of Rome seem to love this quote, as if it actually proves a point for them. It does not. In the above articles from This Rock Magazine, the quote is supposed to prove that Luther believed the Roman Catholic Church determined the canon of Sacred Scripture. Luther is portrayed to be saying the Papacy gave us the Bible. The papacy (maybe even by infallible pronouncement) determined the canon of Scripture for Luther. Brian Harrison thinks the quote is an example of Luther at times coming “…close to recognizing that sola scriptura was false, insofar as he was relying, to some extent, on the despised "Papists" and not only on the Bible.” See, Luther said it himself: the Papists gave us the Bible, without them doing so, we would have never known what Scripture is. 1. Locate a Reference or Citation: Commentary or Sermon? First, thank the Roman Catholic using this quote for providing a reference. Normally, the citation given will simply be “Luther’s commentary on John 16.” Now this is not totally correct. The citation is from Luther’s Sermons on John 16 [LW 24], not a commentary. Luther preached on John 14-16 after March 14, 1537, finishing in either June or July of 1537. The sermons were taken down and edited by Caspar Cruciger. Luther actually credits Cruciger for writing the book. In other words, Luther didn’t sit down and write an exegetical commentary on John. Rather, this quote was the result of preaching, and someone else writing it down the way he heard it. 2. Locate a Translation: Do Catholics Actually Read Luther? The question that I always consider when reading Roman Catholics quote Luther, is if they’ve actually read Luther. This quote serves as a great opportunity to find out. The quote as typically cited, “We are obliged to yield many things to the Papists--that with them is the Word of God, which we received from them; otherwise we should have known nothing at all about it” is not the translation from the standard English 55 volume version of Luther’s Works [Saint Louis: Concordia Publishing House]. Nor is it from the earlier small English set of Luther’s Works (known as the Philadelphia or Holman edition of the Works of Martin Luther), because that set doesn’t contain Luther’s Sermons on John 16. So where did the Roman Catholic citing this quote get it from? They probably can’t tell you, because they haven’t actually read Luther’s Sermons on John 16. They have this quote which they've read somewhere, and thought it made their point. It's probably the result of cut-and-paste, not research. 3. Put the Quote in a Context: What Does Luther Really Mean? Today the pope and his crowd cry out against us that they are the church, since they have received Baptism, the Sacrament, and Holy Writ from the apostles and are their successors. They say: "Where else should God’s people be than where His name is praised, and where the successors and heirs of His apostles are to be found? Surely the Turks, the Tartars, and the heathen cannot be His people. Therefore we must be His people; otherwise it will be altogether impossible to find a people of God on earth. Consequently, he who rebels against us resists the Christian Church and Christ Himself." [LW 24:303]. This will surely offend and repel anyone who is not armed with different weapons and different strength, who listens only to such opinions of the most eminent and influential people on earth. “You are a heretic and an apostle of the devil,” “You are preaching against God’s people and the church, yes, against God Himself.” For it is exceedingly difficult to deprive them of this argument and to talk them out of it. [LW 24:304]. Yes, we ourselves find it difficult to refute it, especially since we concede—as we must—that so much of what they say is true: that the papacy has God’s Word and the office of the apostles, and that we have received Holy Scripture, Baptism, the Sacrament, and the pulpit from them. What would we know of these if it were not for them? Therefore faith, the Christian Church, Christ, and the Holy Spirit must also be found among them. What business have I, then, to preach against them as a pupil preaching against his teachers? Then there come rushing into my heart thoughts like these: “Now I see that I am in error. Oh, if only I had never started this and had never preached a word! For who dares oppose the church, of which we confess in the Creed: I believe in a holy Christian Church, etc.? Now I find this church in the papacy too. It follows, therefore, that if I condemn this church, I am excommunicated, rejected, and damned by God and all the saints.” [LW 24:304]. Is Luther conceding an infallible church gave us the canon? Absolutely not. Is Luther saying an infallible extra-biblical tradition produced the Canon? Absolutely Not. Luther is simply saying that he learned about the Scriptures, Baptism, and the Pulpit, etc. from the Church of his day, in the same way the Prophets were born into a society in which the religious structure of their day was functioning, and gave the Old Testament people a religious context to live in. The visible church indeed promulgated the Scriptures and Christian doctrine. Who can deny this? But simply because they did so, does not mean the visible church in Rome infallibly declared the canon of Scripture. Luther held that the Church was God's hand maid and servant. It does not create God's Word, God's Word creates the Church. As the servant of the Word, it gives the Word to the body of Christ, His people. Indeed, who would know God's Word if it were not for the Church continually upholding it and pointing God's people to it in each generation? One should be able to sense the thrust of Luther's argument: when the visible Church goes bad, going against it is an awesome and fearful undertaking. The Church is God's handmaid. It is to protect and promulgate the Word- but what happens when the servant disobeys the Master? Who can condemn the handmaid and not be fearful? The quote as cited by Roman Catholics has nothing to do with an infallible Church declaring the contents of Scripture. The quote isn't discussing canonicity. The quote isn't discussing if Rome gave us an infallible list of biblical books. Rather, the quote is part of an argument based on Old Testament Israel persecuting God’s true people, and the Roman Catholic Church persecuting the Reformers. This is made clear as Luther continues. Old Testament Judaism had God's law. does this mean they were the ones who infallibly declared what that law was? But what is now our defense? And what is the ground on which we can hold our own against such offense and continue to defy those people? It is nothing else than the masterly statement St. Paul employs in Rom. 9:7: “Not all are children of Abraham because they are his descendants.” Not all who bear the name are Israelites; or, as the saying goes: “Not all who carry long knives are cooks.” Thus not all who lay claim to the title “church” are the church. There is often a great difference between the name and the reality. The name is general. All are called God’s people, children of Abraham, Christ’s disciples and members; but this does not mean that they all are what the name signifies. For the name “church” includes many scoundrels and rascals who refused to obey God’s Word and acted contrary to it. Yet they were called heirs and successors of the holy patriarchs, priests, and prophets. To be sure, they had God’s Law and promise, the temple, and the priesthood. In fact, they should have been God’s people; but they practiced idolatry so freely under the cloak of the name “church” that God was forced to say: “This shall no longer be My temple and priesthood. My people shall no longer be My people. But to those who are not My people it shall be said: ‘You are sons of the living God’ (Hos. 1:10; 2:23). [LW 24:304]. Thus we are also compelled to say: “I believe and am sure that the Christian Church has remained even in the papacy. On the other hand, I know that most of the papists are not the Christian Church, even though they give everyone the impression that they are. Today our popes, cardinals, and bishops are not God’s apostles and bishops; they are the devil’s. And their people are not God’s people; they are the devil’s. And yet some of the papists are true Christians, even though they, too, have been led astray, as Christ foretold in Matt. 24:24. But by the grace of God and with His help they have been preserved in a wonderful manner. [LW 24:305]. In the meantime we adhere to the distinction made here by Christ and do not regard as Christendom those who do not hold truly and absolutely to what Christ taught, gave, and ordained, no matter how great, holy, and learned they may be. We tell them that they are the devil’s church. On the other hand, we want to acknowledge and honor as the true bride of Christ those who remain faithful to His pure Word and have no other comfort for their hearts than this Savior, whom they have received and confessed in Baptism and in whose name they have partaken of the Sacrament. These are the true church. It is not found in only one place, as, for example, under the pope; but it exists over the entire earth wherever Christians are found. Outwardly they may be scattered here and there, but they meet in the words of the Creed: “I believe in God the Father Almighty, and in Jesus Christ, our Lord, who was born, suffered, and died for us on the cross.” In like manner, they pray: “Our Father who art in heaven.” They share the same Spirit, Word, and Sacrament. They all lead the same holy and blessed life, each one according to his calling, whether father, mother, master, servant, etc. Thus whatever we preach, believe, and live, this they all preach, believe, and live. Physically separated and scattered here and there throughout the wide world, we are nevertheless gathered and united in Christ. [LW 24:309]. From these paragraphs, it should be obvious what Luther is driving at. It is the job of the True Church- those who believe and trust only in Christ's righteousness by faith, to call the visible church to repentance. The visible church will claim to be God speaking. The visible church may claim to be that authority which determined the Canon. But if the visible church is in rebellion against God, it is the task of the true Christian to point her back to her master. "We are compelled to concede to the Papists that they have the Word of GOD, that we received it from them, and that without them, we should have no knowledge of it at all." It has now been proved that the powerful voice which speaks with full authority in the name of God, was alone able to establish the Canon of the holy books, and demand our faith in their authenticity and inspiration, and each one of us may say with the great Augustine: "For my own part, I should not have believed the Gospel if I had not been influenced by the authority of the Catholic Church." And with Bossuet, "It is through the Church that the Holy Spirit leads us to believe in the Scriptures, and necessarily so, since it is confessedly the Church which puts the Scriptures into our hands." And with Luther himself: "We are compelled to concede to the papists, that they have the word of God; that we received it from them, and that without them we should have had no knowledge of it at all." Also note this 1994 pro-Roman book that adds the quote is from "Luther's Commentary on St. John." This version is often used on pro-Roman Catholic webpages, too numerous to count. I think you are missing the point. 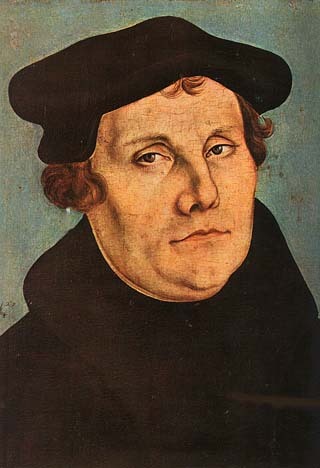 If the Church in which Luther grew up testified to him that the word it was handing down, in written form (the Bible), oral form (preaching) and in ritual form (liturgy) is God's Word, how could Luther contradict it using the Bible, when the very identity of the Bible as the written Word of God would be in question if Luther were to refuse to admit the Church's testimony? If Luther were to accept only the Bible as the Word of God, on what basis would he do it? Luther did not refuse to admit the Church's testimony, he refused to deem the church infallible. This is an old post I know but if the only Church that ever existed up til Luther's time (Catholic Church) was not infallible then wouldn't that render Luther's version of Christianity fallible as well? How could Luther claim being an infallible interpreter of a fallible Church's scripture? Would not a fallible Church's scripture be fallible? Or are you saying it is possible for a fallible Church to produce infallible scripture?That would seam a very shaky foundation indeed! Hi... I'm not sure I'm following completely, but neither Luther (nor myself) believed the Roman church was (or ever was) infallible, nor did Luther believe he was an infallible interpreter of either the church or scripture. Would not a fallible Church's scripture be fallible? Or are you saying it is possible for a fallible Church to produce infallible scripture? Hi James. Thank you for the response. I am not sure what lead me to your site but we Catholics do pray for unity nearly every Sunday so maybe that is why I am here. I do pray that someday the men and women that decided to follow Luther and the many others do decide to come home and be reunited with their brothers and sisters in Christ in the Church that Jesus Christ established. My ancestors moved to the U.S. from Luther's backyard there in Germany at about the same time as the reformation so I sometimes wondered why they were still Catholic. They even vowed to build a church here if God grant them safe passage. You see if you truly believe in Jesus Christ then you have to know in your heart that the Holy Spirit could not and would not allow the Church, that Jesus Christ established, to teach anything in error (infallibility). The church though has never claimed that its members are impeccable. After all Jesus chose Peter to be his Vicar on earth and we all know that Peter denied the Lord three times and cut off the servants ear. So Peter was not impeccable but being led by the Holy Spirit was infallible when it came to shepherding the flock of Christ here on earth. And as it is Peter has passed the Vicar's keys that Jesus Christ gave him on down the line unto today. You also have to know in your heart that the Holy Spirit would never allow the Church that Jesus Christ established to lose those keys to his kingdom. Peace be with you and I pray the Holy Spirit will guide you on your journey. Catholic's can claim no more than Mormons and us. None of selected the books.